The missing feature of the Blockchain-technology: the secure private-key-solution. Check the security features via the app. Scan the address as a QR code on the card (or, alternatively, enter it manually) using your preferred digital wallet. Charge any amount of a cryptocurrency to the Chainlock card – you can also recharge the card several times. You can check the amount of the cryptocurrency using a block explorer or the Chainlock app. Expose the private key beneath the security seal / protective sticker. Scan the private key as a QR code (or, alternatively, enter it manually) using your preferred digital wallet. 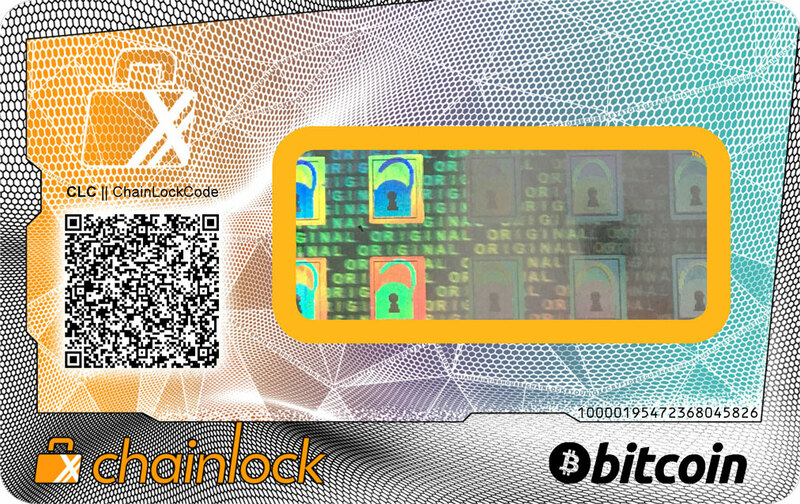 Load the cryptocurrency from the Chainlock card into your digital wallet. The security seal can be removed in advance to check the existing private key. It can then be covered again with the provided protective sticker. The private key should only be read by the Chainlock card’s user and in a safe surrounding. The private key provides access to all cryptocurrency amounts linked to the card. A broken security seal (“seal broken”) is a sign that a manipulation has occurred. Key generation in the high-security zone of the Austrian State Printing House (OeSD): the generation procedure, for which a patent application has been filed, ensures that nobody can view the key pair – not even OeSD staff. the security seal ensures that the private key cannot be secretly read; the signature procedure, for which a patent application has been filed, protects against an exchange of the address. the card is robust, handy, credit-card-sized as well as water- and heat-resistant. at any secure place (private safe or safe deposit box in a bank). unauthorised access to the private key via internet, WLAN, NFC, CryptoLocker, private-key scammers, etc. can be ruled out entirely. coins created through forks benefit the private key’s owner. the user is the sole person who can access the private key. The app will guide you through the process. ChainLockCode (CLC) is an additional security feature and a component of the unique procedure for which a patent application has been filed. It further protects the information on the card cryptographically and enables a check of this information with the Chainlock app. Where can I get a Chainlock card? The Austrian State Printing House (OeSD) Group is an Austrian high-security company with a focus on secure identities. As a full-service provider of ID and e-government solutions, OeSD develops, implements and offers personalisation solutions for identity documents such as the highly secure Austrian passport. In 2018, the portfolio was extended through the innovative spin-off YOUNIQX Identity AG, which offers solutions in the field of secure digital identities. With MICK (My Identity Check), the highly secure video identification service, MIA (My Identity App), the world’s first system offering integrated identity management, and Chainlock, the secure private key, the company is optimally prepared for the digital future.